Photo provided by NASA shows Hurricane Florence from the International Space Station on Sept. 10, 2018, as it threatens the U.S. East Coast. Parts of North Carolina and South Carolina are being evacuated, as Hurricane Florence strengthened into a major Category 4 hurricane, packing winds of up to 220 kilometers an hour in the North Atlantic Ocean. The National Hurricane Center (NHC) expects Florence to pass between Bermuda and the Bahamas on Tuesday and Wednesday, and then approach the U.S. states of North Carolina and South Carolina by late Thursday into Friday. South Carolina's governor Monday ordered the state's entire coastline to evacuate and predicted as many as 1 million people would flee. North Carolina ordered evacuations for the Outer Banks barrier islands, including popular tourist destination Hatteras Island. By the time it reaches the U.S. mainland, the NHC said Florence will strengthen into "an extremely dangerous major hurricane." The Pentagon said Monday it has sent an advance military team to an emergency operations center in Raleigh, North Carolina, to coordinate with federal and state partners. Troops have received ready-to-deploy orders for Virginia, South Carolina and North Carolina. Both Carolinas, along with Virginia and Maryland, have declared states of emergency, and authorities as far north as New Jersey are warning people along the coast to take precautions. The NHC said the storm is forecast to linger over the Carolinas once it makes landfall, causing a potential for severe flooding in areas already soaked by heavy rain. President Donald Trump tweeted to residents in the storm's path, urging them to "please take all necessary precautions." "To the incredible citizens of North Carolina, South Carolina and the entire East Coast — the storm looks very bad!" wrote the president, who canceled a planned rally Friday in Mississippi because of the impending storm. Customers line up to buy propane at Socastee Hardware store, ahead of the arrival of Hurricane Florence in Myrtle Beach, South Carolina, Sept. 10, 2018. North Carolina governor Roy Cooper asked Trump for an early disaster declaration on Monday to prepare for anticipated damage in the state. "North Carolina faces three threats here. First, the ocean surge along our coast. Then, the strong winds, which may be higher than the other hurricanes that we have recently experienced. And, of course, inland flooding from heavy rain. And we here in North Carolina are bracing for a hard hit," he told a news conference. "Today, let me be clear. 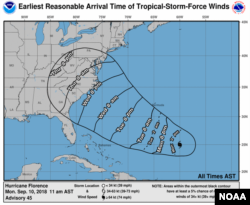 North Carolina is taking Hurricane Florence seriously, and you should too. Get ready now." Isaac is smaller and weaker than Florence. The NHC expects it to be downgraded to a tropical storm by Friday and Saturday as it moves near or south of Puerto Rico and the Dominican Republic.